The Warrior image represents bravery, strength, and an unwavering commitment to persist through adversity. There’s no mistaking Warrior for its smooth, rich taste of a genuine Native American Premium Blend Tobacco. Warrior’s iconic, eye-catching packaging boldly tells consumers: "Welcome to Warrior Territory, where smoking costs far less. 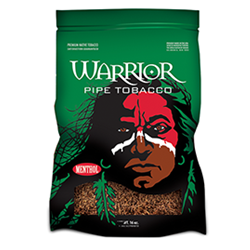 Try Warrior Pipe Tobacco today, right here at Smokers Discounts!